RVing is a great way to get away from it all without having to leave it all behind. But sometimes even an RV getaway can not be StressLess Camping. How? The reason you’re heading out. California is thinking of adding a new season to the traditional four that we’re all familiar with - fire season. Sure, winter, spring, summer and fall are great but there are many among us that think we should add fire as the fifth season on the list. And it’s fire season that prompted an unplanned getaway for us at StressLess Camping. Peggy and I watched as the River and Ranch fires, which joined forces to become the Mendocino Complex Fire, blazed over the mountains from Mendocino directly toward the community we live in. Common logic used to dictate that, if you live in a relatively populated area, you’re going to be fine when it comes to fire season. However last year’s fires that devastated Northern California, particularly Santa Rosa, showed that fire doesn’t care what your address is or who your neighbors are. So as we watched the fire crest the hill we were certainly concerned. And then it came - evacuation advisory for our little community. Ut oh. Peggy and I grabbed clothes and supplies along with a few things we had in a “bug out” stash and packed the travel trailer and pickup. We then hooked it all up and called a campground on the northern most tip of our county, Clear Lake Campground, where we found there were absolutely still reservations. Off we went looking back at the StressLess Camping world headquarters (our house) and headed out, not knowing if the house would be there when we came back. At Clear Lake Campground we found a lot of our favorite people doing just what we were doing. So, really, it became a party. A good one and I had happened to fill two growlers with beer from Kelsey Creek Brewing Company on the way out. Priorities, right? While there was the undercurrent of apprehension about all of our various dwellings and the stuff we had collected over a lifetime, there were also some truly wonderful people. The campers were little to big, new to vintage. And I also felt very privileged when I saw that some people were camping in their cars or in tiny tents. Some folks had stuffed their vehicles to the brim with their favorite belongings and then left barely enough room for themselves. So, compared to what it could be, Peggy and I and our friend Linda in our 19’ Rockwood Mini Lite felt like pure luxury. And everyone there closely watched the progression of the fires - some were more concerned with the Ranch Fire, others the River Fire. What you don’t think of during these times is that, since many of the major arteries were blocked to the county, there was no getting in with delivery trucks so the stores were quickly running out of supplies. Stores that were well stocked had their front doors locked as they were in the evacuation areas. And everybody was asked to conserve resources as much as possible, especially water. The power went on and off while nervous people hoped and prayed. Among the evacuees were spouses of people on the fire line, people who were working in the Emergency Evacuation Services, retirees, kids, nerds, country folk, dogs, cats, birds, our desert tortoise, and even Mr. Lake County, Gary Deas. Gary is one of the most selfless and wonderful people you’ll ever care to meet and his role as Mr. Lake County is well deserved and he has truly lived up to the title. If you need a hand, he’s there for you. Mr. Lake County’s family last year lost a lot in the fires that scorched Santa Rosa and he used his ranch to put up a crazy number of people in RVs, tents and more. He and his wonderful wife, Lacey, cooked and helped people out. But now the shoe was looking to be on the other foot. And the Deas family were worried that that shoe was going to kick them right to the curb. After two days, word came that the entire county may have to bug out. So Peggy and I made reservations further south in Healdsburg and packed up, once again, making our way through mountain back roads with our little travel trailer tailgating us. This time Linda had friends near our new evacuation spot so she went there and Peggy and I continued our unplanned journey to a new campground. Over the next week I went back to work while Peggy stayed at the campsite. The entire county was shut down by evacuations with the county seat being in the evacuation area, so no work for her. I got to spend the day with people talking about their RV dreams while Peggy monitored the sporadic updates, mostly via social media, about what was going on. During what seemed like an eternity word came that the firefighters were able to save the homes while the hillsides burned into the largest wildfire in California’s recorded history. As the fire burned away from the more populated areas of the county, alerts came through of sections of the community that were opening back up. Ours was one of the earliest ones to open back up, though most of the major roads were still closed so we elected to stay at the campsite. Finally, after a week away, Peggy and I returned to our house. Many others had already returned to theirs, but not everybody. And, as I write this, the fire rages on albeit away from the County seat and surrounding towns. This time. Gary’s family lost a home in this fire. Other friends lost cabins and buildings on their ranches that had been in the family for generations. 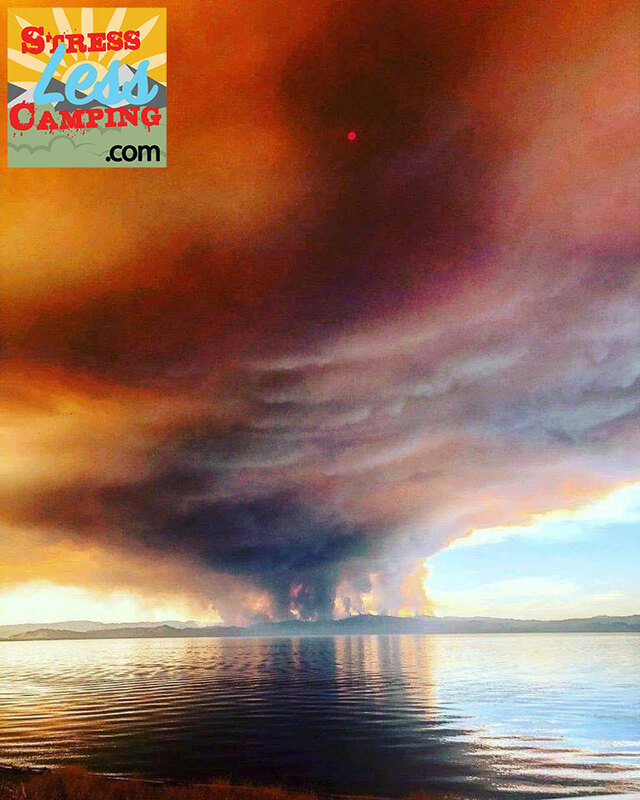 The hillsides look like a war zone and helicopters and planes continue to dip water out of Clear Lake, the second-oldest lake in the world, to help quash the flames. Ours isn’t the only wildfire that burns this year - and it’s still considered early in fire season. 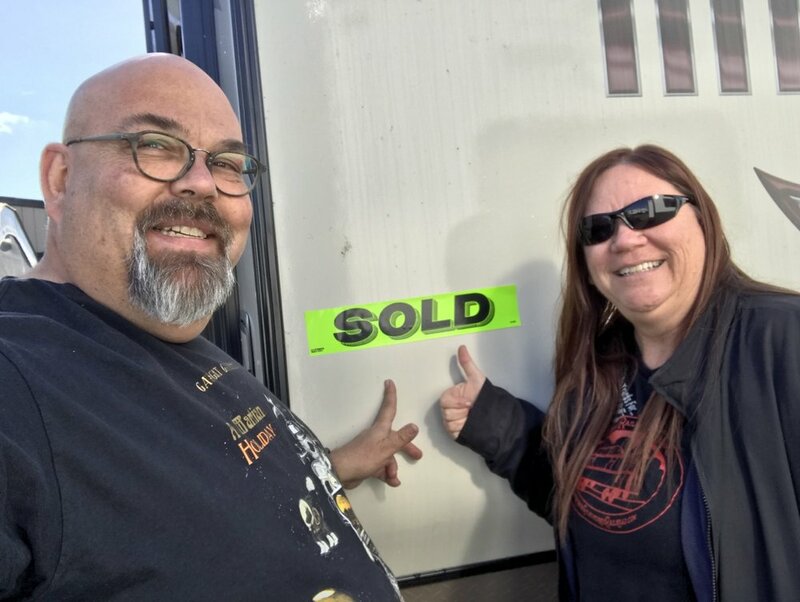 The moral of all this is that owning an RV of any kind isn’t just the best way to vacation, but also offers a bit of a security blanket that can become quite valuable when things go south. Natural disasters aren’t as unnatural as they used to be and they seem to want to invade all the corners of the world. In addition to keeping our Rockwood Mini Lite ready for bug out, we’re also repackaging things in our lives so that irreplaceable portable items (like my dad’s watch that he got as a gift when I was born) are in a spot that’s easy to grab. We’ve been scanning photos like mad and making sure they’re all in “the cloud” but also backed up locally in several redundant places. Let’s hope all your camping trips are StressLess Camping. But, if disaster comes calling, I hope your experience is as good as ours was. This time. As there’s still next summer. Er, fire season.